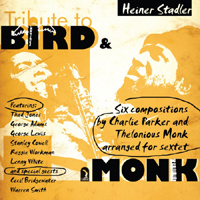 Tribute to Bird & Monk is a scintillating blast recorded in 1978, when the battle lines between innovation and the tradition were clearly drawn. 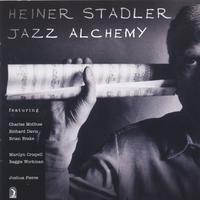 In tackling compositions by Thelonious Monk and Charlie Parker, and casting them in a fresh light, arranger Heiner Stadler obviously wasn't shy about playing the provocative agent. Initially it sounds as if he was intent only on realizing music that was as far removed from the source material as possible. However, upon repeated exposure to his recasting, it's clear that his effort and that of the crack band is a combined exercise in alternative realization. Monk's "Ba-lue-Bolivar Ba-lues-are" comes closest to bridging the gap between tradition and innovation. Such is the nature of Monk's music that the distinction between tradition and innovation is arguably superfluous, and when Reggie Workman's bowed bass takes up the story he makes the point persuasively. The scrabbling horns are redolent of all things free but the music's progress is the stuff of shared endeavor, with the sharing encompassing the late composer. George Adams's relatively straight tenor sax reading of the melody to Parker's "Au Privave" rebukes the notion that free players are incapable of playing straight. Trombonist George Lewis was working with Anthony Braxton at the time of this recording, and brings that experience to bear in his solo. To be sure, Thad Jones was the closest link to the tradition in this band, having been in Count Basie's trumpet section back in the 1950s. Still, his cornet playing on "Misterioso" has the air of Don Cherry about it, and again the collective endeavor comes to full fruition when playing Monk's music. Surprisingly Warren Smith's timpani playing brings shades of quietly realized satire, as opposed to mere bluster. Pianist Stanley Cowell applies only his own touch, and there's something admirable in the way he doesn't try to tackle Monk's inimitable spirit head on. It all makes for something special, not least because the project still results in some extraordinary insights. Track Listing: Air Conditioning; Ba-lue Bolivar Ba-lues-are; Au Privave; Straight No Chaser; Misterioso; Perhaps. 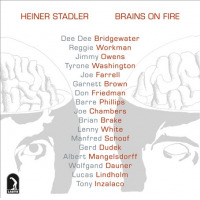 Personnel: Heiner Stadler: arranger; Thad Jones: cornet (1, 3-5), flugelhorn (6); George Adams: tenor saxophone, flute (6); George Lewis: trombone; Stanley Cowell: piano; Reggie Workman: bass; Lenny White: drums; Cecil Bridgewater: trumpet (2); Warren Smith: timpani (5, 6).